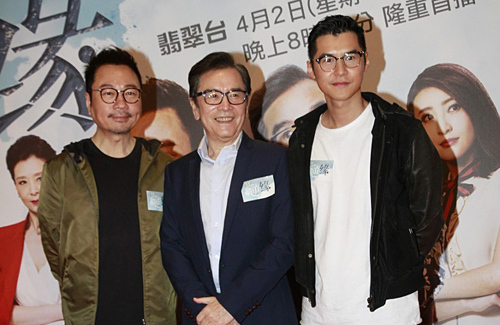 Since it has been one year since Wayne Lai‘s (黎耀祥) drama has been aired, viewers are eager to see the three-time TV King onscreen again, especially since he portrays a greedy feng shui master in Daddy Cool <逆緣>. Airing on April 2, the drama also stars David Chiang (姜大衛), Carlos Chan (陳家樂) Joel Chan (陳山聰), and Rosina Lam (林夏薇). With his son Lai Ching Kiu (黎正僑) studying in the United States now, Wayne trusts him to make the right decisions. “He is responsible for his own life. I always tell him this. If he does the wrong thing, it doesn’t involve me. How many years do I still have left with him? Maybe 20 years or so.” Wayne’s son will be returning to Hong Kong during the Easter break. Afterward, Wayne will be heading to Mainland China to film a drama. At the event today, feng shui master Mak Ling Ling (麥玲玲) was also on board to divine the artistes’ fortune tellings through the Chinese characters they wrote. Mak Ling Ling told Wayne that he has a high chance to become a property owner again this year. Carlos will have good luck in increasing his financial assets, but it will take time before he can purchase his own property. Don’t believe in Feng Shui. Skip!